Religion and healing for the Mursi are very much inter-connected. The Mursi are guided in matters of religion by their experience of the world around them, rather than by a strict theological doctrine. Similarly, illness is not seen as a mere process in the body but as stemming from a disturbance in the relationship between persons and their social and natural environment. Healing: A knowledge of illness and of the divine emerges from people’s experiences of the natural and social world. The Priests provide the context for a healthy community and it is the Priest as well as other lesser ritual families (e’wu) who are sought out to treat epidemics, drought, and crop pests. However, there are also technically people (pl. nana sg. nani) who gain a reputation for their ability to make things with their hands, compose poetry, and shape the horns of cattle. Some nana are also able to treat an open wound that may need cleaning with a powerful herb. Others may act as expert surgeons if someone sustains a nasty injury during a ceremonial duel or if they are hurt by a frisky bull or startled wild animal: for example, a man impaled on the horns of a bull had his stomach put back into his torso, and a nani used part of a calabash to hold the stomach in place while the skin was closed and healed. However, it is the healing women (pl. ngerrêa, sg. ngerrê) who are the most active in treating illness in the community on a daily basis. Tumwi manifests itself to the healer through Things of the Sky, such as the rainbow, fallen birds, or stones that have fallen from the sky. A healing woman is a woman of Tumwi, and she draws on this in her healing activities. Things of the Sky are often colours of the rain or the rainbow, which are pink and green, and so it is with pink and green clay that a healer uses to treat afflictions associated with Tumwi. Anyi kagayo sio ko saba kare. Inye nga gayo akimi a bha nui, huli keheyê iwana galgin na ojosen nyabi, na kumito. Na agge akimi a naw ke ngerrê huli hiri illasi kunna aje dhamwê na shh shh, sab nag gwino, na leto. I know the smells based both on the knowing in my hands and my head. Don’t you know that in your land [i.e. the world of biomedicine] a doctor uses a stethoscope [galgin] and puts it to his ear, and touches or feels. We are our own doctors, and when a person is sick, they come and give me tobacco, and I will do shh shh, and smell and look, and do leto. These are the diagnostic techniques of the healers. She is guided in her diagnosis by her kulê, which Dashi described as a small insect crawling around inside her head. The Kulê has to be woken, or made to banawê, ‘stand-up’. This is achieved by wiping the armpits with a gourd of coffee, or beer, or with pink (rêggê) or green (chagi) clay. 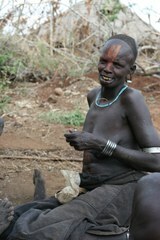 Substances such as beer, porridge or coffee, or cash, or a goat or cow are often given to ngerrêa as payment (tomoga). What is important about such payments is that they are shared with a ngerrê’s ancestor spirit (mênênga) either through spilling or throwing some of the tomoga onto the ground and a ngerrê will ‘eat’ them by rubbing them on her forehead, under her armpits or on her stomach. A healer usually specialises in certain illnesses. Some are able to treat illnesses loosely referred to as bhusoy (evil eye), such as rima, kalawari, keno or mênênga, while others specialise in muttan, illnesses which are seen as having an environmental cause, such as kidho or to have come from God. Leto, the diagnostic technique, is also part of the cure to remove illness from the body. 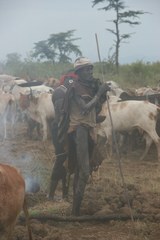 Healers remove things that have entered the body of their own accord, for example at the river or at a water hole, as in the case of kidho (river). Or they may remove things such as keno (wood) which have entered a person’s body because of a curse placed upon them. Healers also use plants, dung and clay to remove an illness or prevent the illness from ‘striking’ a person. Substances such as clay, dung and plants are particularly used to protect a person from the illness- causing substances keno and kidho. Healing and Modernity: The Mursi are aware of the limitations of their traditional healing methods, but access to biomedicine involves a long and sometimes dangerous journey to town or to the SIM mission station in the Mago Valley. Most Mursi experiences of biomedicine involve visits to Jinka pharmacists or small clinics; the care they receive here is often very poor and profit oriented. Several successful vaccination programmes have been run by the SIM but childhood epidemics are still common. In 2010 a measles (shisha) epidemic led to the death of many children.